An organ involved with the elimination of water and waste products from the body. In vertebrates the kidneys are paired organs located close to the spine dorsally in the body cavity. They consist of a number of smaller functional units called urinary tubules or nephrons. The nephrons open to large ducts, the collecting ducts, which open into a ureter. The two ureters run backward to open into the cloaca or into a urinary bladder. In mammals, the kidneys are bean-shaped and found between the thorax and the pelvis. The number, structure, and function of the nephrons vary with evolution and, in certain significant ways, with the adaptation of the animals to their various habitats. In its most primitive form, found only in invertebrates, the nephron has a funnel opening into the coelomic cavity followed by a urinary tubule leading to an excretory pore. In amphibians, some of the tubules have this funnel, but most of the tubules have a Bowman capsule (see illustration). In all higher vertebrates, the nephron has the Bowman capsule, which surrounds a tuft of capillary loops, called the glomerulus, constituting the closed end of the nephron. The inner epithelial wall of the Bowman capsule is in intimate contact with the endothelial wall of the capillaries. The wall of the capillaries, together with the inner wall of the Bowman capsule, forms a membrane ideally suited for filtration of the blood. 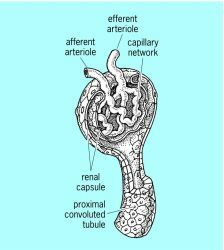 The blood pressure in the capillaries of the glomerulus causes filtering of blood by forcing fluid, small molecules, and ions through the membrane into the lumen of Bowman's capsule. This filtrate contains some of the proteins and all of the smaller molecules in the blood. As the filtrate passes down through the tubule, the walls of the tubule extract those substances not destined for excretion and return them to the blood in adjacent capillaries. Many substances which are toxic to the organism are moved in the opposite direction from the blood into the tubules. The urine thus produced by each nephron is conveyed by the collecting duct and ureter to the cloaca or bladder from which it can be eliminated. Either of a pair of organs involved with the elimination of water and waste products from the body of vertebrates; in humans they are bean-shaped, about 5 inches (12.7 centimeters) long, and are located in the posterior part of the abdomen behind the peritoneum.